Suggested correction: He's addressing Felicity, he just turns around to look at Nyssa accusingly while he says it. No, the mistake is correct. In the scene, both Diggle and Felicity are addressing Nyssa. First, Felicity says "Oliver wouldn't. I don't see how." Diggle then says his line. The "she" Diggle is referring to is Felicity (i.e. "what Felicity is trying to say"). Factual error: There is no way Laurel Lance would have been allowed on the prosecution team for Moira Queen's murder trial. Due to the facts that she used to date the defendant's son, the defendant's daughter used to intern for her, and her boyfriend was one of the people killed in the Glades it would have taken all of two seconds for the court to have her removed if she didn't willingly recuse herself, since her presence would be a major conflict of interest. Laurel also was Oliver's lawyer when he was on trial in season 1, which also wouldn't be allowed. Character mistake: When Oliver is brought into Fires' tent, he gets pushed into a pole by one of the guards. Take a close look at his handcuffs. They are so loose, he could easily escape from that. Not only that, but no guard who had any training would ever put handcuffs so loosely on someone they would treat as "hostile". Factual error: When Oliver is hunting Prometheus, they come face to face. Oliver fires an arrow, which is tracked in slow motion before being split by one of Prometheus' throwing stars. 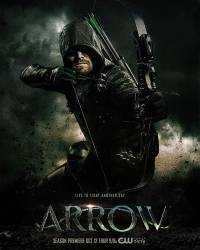 Problem is that Oliver's arrow is, well, flying straight as an arrow. But in reality, when you film an arrow in slow motion, they flex and wobble, and definitely wouldn't fly like the one shown on screen. Character mistake: At one point Felicity says, "There's at least a teraflop of data to go through." Felicity is a computer genius, so she should know that a teraflop is a measurement of processing power, not data storage. She should have said "terabyte." Suggested correction: No science behind this statement. What is it supposed to mean? Continuity mistake: When Oliver shoots Ted with an arrow, Ted falls down on the ground. The position of the arrow keeps changing from being perfectly in the center of the chest, to a few inches off-center, depending on the angle. Visible crew/equipment: When Oliver jumps out of the window of Adam Hunt's office, you can see the safety rope at the bottom. 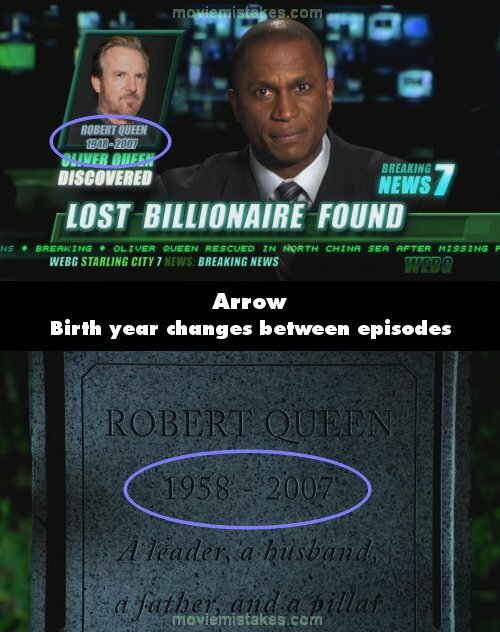 Continuity mistake: In the scene in the garden where Oliver and his sister stand by the headstones, Robert Queen's birth date is carved into the stone as 1958. This conflicts with the news report at the beginning of episode 1 when his birth date is shown as 1948. Suggested correction: It's not a crew member, it's wind. Deliberate mistake: During the big battle, Arrow is knocked down and when he opens his eyes, the reflection in his eyes is tilted over to give the sense he's seeing things sideways. But the reflection should still have shown the proper orientation no matter what orientation his eye was at. Think of looking into a mirror and then rotating the mirror to the side, the reflection wouldn't rotate. Oliver Queen: Right. The knife. I got lucky. John Diggle: That was a kitchen knife. It wasn't even weighted properly and yet you threw it with accuracy across a ten foot room. Oliver Queen: Exactly. I got lucky. Although Laurel is a couple of years older than Sara, Katie Cassidy is only about a month older than Caity Lotz.